Midwest Interstate Passenger Rail Commission (MIPRC) members Randy Truitt, Indiana State Representative from West Lafayette, and Marvin Scott of Indianapolis joined fellow commissioners and friends of the commission to experience the 110 mph speed that Amtrak trains have been achieving between Porter, Indiana and Kalamazoo, Michigan since February. Marvin Jr.'s smart phone says it all. See below for a half minute video or keep reading to learn more about their trip and the local progress of high speed rail. Just a reminder: The MIPRC is a legislatively created advocacy body that has four commissioners from each of eleven midwest states. The state legislature designates two appointees, and the governor selects a private sector designee as well as his/her representative. 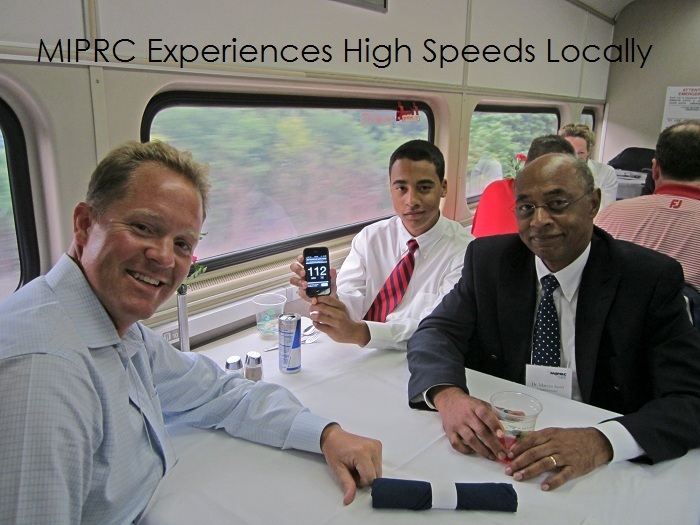 The MIPRC contingent boarded Amtrak's Wolverine at Chicago's Union Station at 4:10 P.M. (5:10 EDT) on June 10th. After the typically slow ride through Chicago and northwest Indiana, the train picked up speed just east of Porter, Indiana and frequently hit 110 mph en route to an early 7:26 P.M. (EDT) arrival in Kalamazoo. The Commission held its day-long meeting the next day and then returned to Union Station having experienced the first corridor segment--other than in the northeast corridor--that reaches the 110 miles per hour speed envisioned for all the major intercity passenger rail routes in the Midwest -- "back to the future" as Commissioner Scott so aptly noted. Because this section of track is owned by Amtrak, many of the improvements needed for the optimal speed have been completed. Several road crossings have yet to be improved so the train slowed a little at these locations, but the overall experience was a smooth, fast trip on this upgraded portion of the corridor. The State of Michigan is in the process of acquiring the corridor from Kalamazoo to Dearborn, which will be followed by final design and construction upgrades for this portion of the line. Construction in Chicago will begin soon on a major separation of the Norfolk Southern freight rail track used by Amtrak from local commuter lines. This Englewood Flyover will eliminate one of the most congested rail bottlenecks in the country. A $72 million effort in northwest Indiana, which is being done with stimulus funds (ARRA), is expected to begin next year and will reduce some of the congestion along that same Norfolk Southern line into Chicago, which carries many Amtrak trains. Illinois, Indiana, and Michigan have agreed to move forward with a comprehensive study that will help determine ways to further reduce rail congestion and let trains achieve higher speeds between Chicago and Porter, Indiana. The study is being funded by a $3.2 million grant from the Federal Railroad Administration and $200,000 each from the three states and from Norfolk Southern.